Hello, and welcome to Julie's Genealogical Journeys. This page provides an introduction for the surnames below. Additional genealogical information, including a GED file and photographs is on my Family Tree Maker Web Site. Wilrena Richbourg, standing, with Henry and Geneva. About 1925. Adair, Joseph: Bef 1800 GA> 1800 LA> 1817 MS> 1867 TX I have tracked my Adair line back to Joseph Adair, found in GA around 1800. 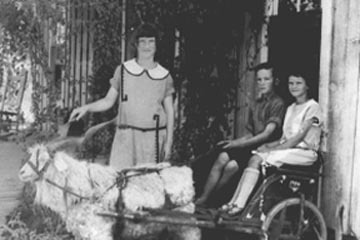 This family eventually migrated to Louisiana, Missisippi and Texas. Much of the information in my database comes from a family bible. Baker, Alexander N: Bef 1635 London England> 1635 MA> abt 1655 VA> 1779 NC> 1842 KY> 1850 IA> 1854 TX Alexander and Elizabeth were English Puritans who landed in Plymouth colony in 1635. They eventually moved to Boston, then down the East Coast into North Carolina. In approximately 1845 the Martin Baker family begin making their way to Kentucky, Iowa, and by early 1850s, into Texas. This Baker line is fairly well documented. Clayton, John Pope; 1800 ?>1832 GA> 1860 AL> abt 1873 TN> 1880 TX John and Annie Juliet were married around 1820. The family migrated into Alabama, Tennessee, and eventually into Texas. This has been a tough line to document, especially prior to 1850. Crie, William; Bef 1798 Glasgow, North Britain> 1802 ME> 1872 MO> 1877 TX The Crie family arrived in Portland, Maine from Scotland sometime between 1798 and 1802. After the Civil War, my great-great grandfather, Edward Crie, moved to Missouri and eventually into Texas (1880). This information is very well documented; most of the data came directly from a family Bible. Ellison, Robert: Bef 1695 VA> 1720 SC> 1840 MS> 1850 TX The Ellison's migrated from Virginia into South Carolina, Missisippi, and Texas. This line is fairly well documented. Griswold, Joseph: 1646 CT> 1839 ME> 1841 MA> 1850 ME> 1872 MO> 1877 TX The Griswolds stayed in New England area until the Civil War at which time Edward H. Crie made his way to Missouri and eventually into Texas. Howard, Samuel Green: 1826 GA> ?AL> 1850 TX Samuel Greene Howard and Nancy Parker were married in 1848 in Nacogdoches Co., Texas. 1860 has the family, included my great grand mother, Mary Elizabeth Howard, in Woods County, TX. Samuel was born in Georgia in 1826. This line has been a tough one to research and document. Richbourg (Richebourg)Claude; Bef 1700 Berry, France> 1700 SC> 1820 MS> 1870 TX The Richebourgs were Huguenot refugees from France and arrived in Virginia in 1700. My Richbourg ancestors eventually migrated into Alabama, Mississippi and Texas. The information on the Richbourg family is reasonably well documented. This web page was last updated by Julie Clayton November 4, 2002. Feel free to drop me a line with questions or comments about this web site and its contents.